Attendees praying in front of the. Taiwan No To monument at the Peace Memorial Park in Itoman on June 26. Taiwan No To monument was erected for Taiwan’s World War Two war dead, at the Peace Memorial Park in Mabuni, Itoman city. A completion ceremony was held on June 25. The fourth memorial service for the Taiwanese war dead was also held on the same day, and 60 people gathered to pray for peace as well as friendly relations between Japan and Taiwan in front of the new memorial monument. 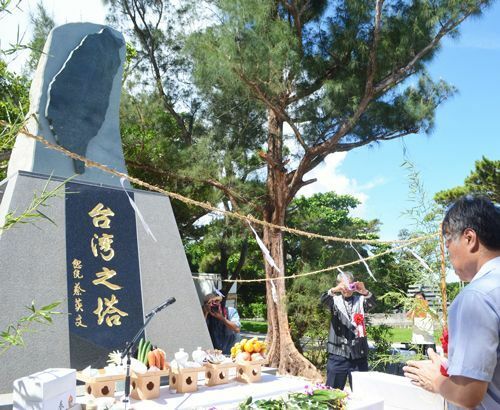 The monument was begun by the General Incorporated Association of Japan Taiwan Peace Foundation in 2015 as the year marked the 70th year since the war. The property was provided by the Okinawa Yokuyukai and is located right next to the Kuge No To monument, which is also maintained by the organization. The front side of the monument is shaped like Taiwan.